How can I add, reschedule or cancel a visit? Helpers can reschedule, cancel and create new visits on behalf of Members or Authorised Representatives. You can work with Members and Authorised Representatives about the best time to schedule visits. You can reschedule and cancel visits and add new ones at their request. They’ll receive a text message to confirm any changes you make. You will need to be matched to the Member and assigned as a Primary Helper by a Community Manager to add visits. Speak to the Community Manager if your Member does not appear in your list. If you are unable to attend a visit requested, then please contact the Community Manager so they can find an alternative Helper. Please note that you can't reschedule or cancel visits that are in the past. If you need to change a past visit, please contact your Community Manager. Tap on the (+) plus icon in the top right. 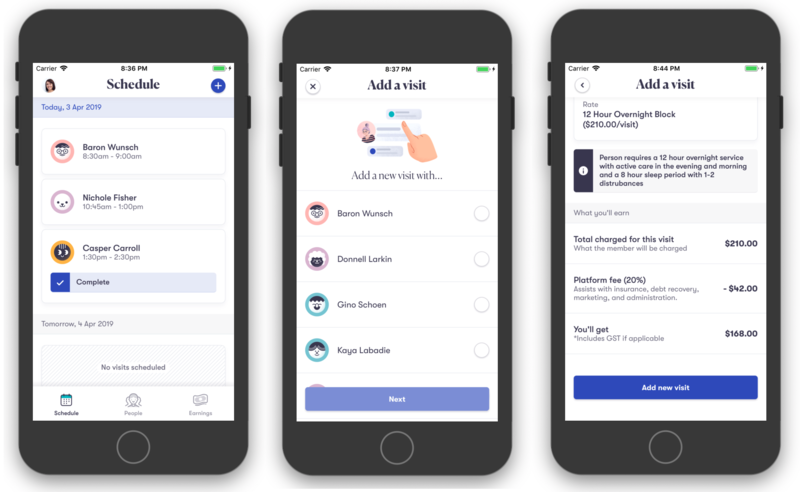 Choose the Member you are adding the visit for and tap Next (Note: You will need to be assigned as a Primary Helper by a Community Manager to add visits for a Member. Speak to your Community Manager if your Member does not appear in your list). Choose the Services you will be providing the Member and tap Next. Select the When the visit is and the Start and Finish time. Select the Rate you will be charging for the visit. This will either be standard hourly, 12, or 24-hour rates. (Note: Only use 12 or 24-hours rates when attending a 12 or 24-hour visit). Review the What you'll earn details and then tap Add new visit. Confirm visit has been added in the confirmation message. Tap on the visit you would like to change. In the shortcut menu, tap Reschedule. Make any adjustments to the visit and tap Save Changes. Confirm the visit has been changed in the confirmation message. Tap on the visit you would like to cancel. In the shortcut menu tap Cancel. 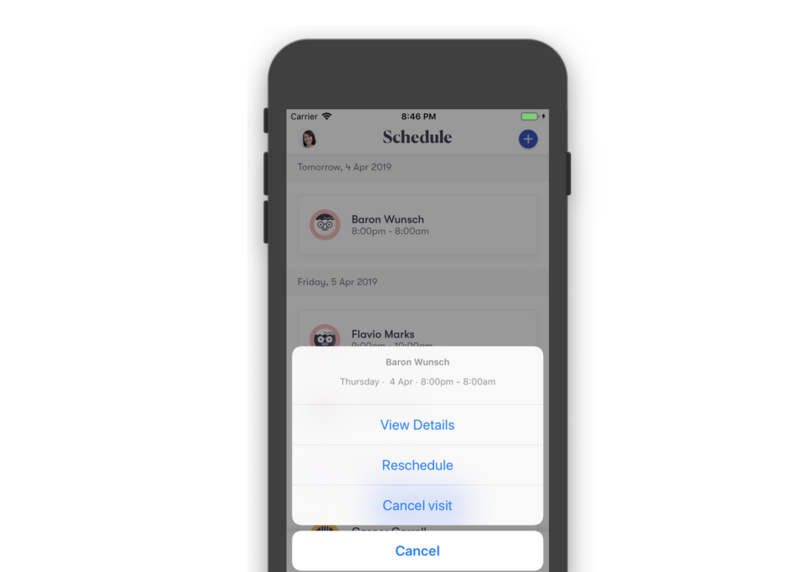 Add a detailed reason for the cancellation and tap Cancel visit. When can a Helper cancel a visit? A Helper can cancel a visit in the future provided the Member and/or Authorised Representative has agreed and the visit has been agreed to be covered by family or another Helper. If a visit is in the past it cannot be cancelled more than 72 hours after the visit was scheduled to commence. Who is notified when a visit is cancelled? When a visit is cancelled, the Member and/or Authorised Representative receive an SMS informing them of the changes. When can a Helper add a visit? A Helper can add a visit at any time when requested/approval of a Member, Authorised Representative or Community Manager - or when switching an existing visit with another Helper. The only limitation is to make sure the Member has funds to pay for additional visits. Helpers can't add visits that are in the past. They are required to contact a Community Manager. Who is notified when a visit is added? When can a Helper Reschedule a visit? A Helper can reschedule a future visit at any time when requested/approval of a Member, Authorised Representative or Community Manager - or when switching an existing visit with another Helper. The only limitation is to make sure the Member has funds to pay for any additional time added. Helpers can't reschedule visits more than 72 hours after a visit was scheduled to begin. They are required to contact a Community Manager. Who is notified when a visit is rescheduled? When a visit is rescheduled, the Member and/or Authorised Representative receive an SMS informing them of the changes. What if the visit is an error? Helpers can't reschedule or cancel visits that are more than 5 hours in the past. If they need to change a past visit or a visit that is already checked out, they should contact a Community Manager. How do I use the account as a Helper? Do I need to leave the website or app open during a visit?